We all depend upon the quality and work of judges for help in improving our exhibits, and often, to serve as examples for new judges coming into the system. Until 2007, there was no mechanism for recognizing those judges who have done an outstanding job over a prolonged period showing sustained excellence in their judging skills (especially in helping exhibitors) and in innovating and improving the judging process. 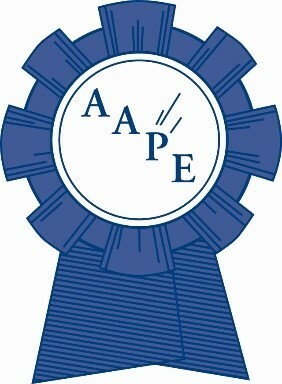 In 2007, the AAPE Board approved the creation of a new award to give that recognition. The award may be given yearly, for service as a philatelic judge, a literature judge, or for work in both disciplines, to a living judge who meets the criteria set out below. It may not be given to the same individual more than one time. If there are no suitable nominations in any given year, the award will not be given. The first time the award was given was in 2007, to a long-time judge of whom it can be said that he was a living legend: Bernard A. Hennig, Jr. of Chicago. It was unanimously decided by the Board that the award would henceforth be named in his honor. Nominations from AAPE members (especially from exhibitors and other judges) are always in order, and should be submitted using the form that follows. Nominations are referred to a committee composed of the most senior living recipient, and the last four living recipients. If a nominator is not familiar with the entire history of a judge but believes the judge has been exceptional, fill out the form as best you can, and the committee will add any factors that should be considered. A nominee must have been continuously active as a judge for seven or more years at the World Series of Philately level, but quality work at the regional level and at the FIP level may also be included in the nomination. Nominees should be broad gauged, and have an unblemished reputation as fair and without bias. Nominees should have established a reputation for being prepared to judge, accuracy in evaluation, and for providing accurate and useful feedback to exhibitors. Nominees should be known as giving freely of their time to exhibitors, often outside of the formal feedback sessions, including acting as a mentor for those developing new exhibits. Nominees should be known as collegial to other jury members; able to express reasoned opinions without being abrasive. Nominees should have demonstrated that they take seriously the responsibility of all jury members to evaluate, encourage and mentor apprentice judges. Credit should also be given to service as the chair or a participating member of the APS Committee on the Accreditation of National Exhibitions and Judges (CANEJ), and for writing articles on judging and exhibiting to encourage new people coming into exhibiting, and for contributing content for the APS Manual of Philatelic Judging. Efforts in this realm go beyond simply holding office or membership in a committee. Nominators should cite specifics regarding activities the judge has initiated or been involved in to broaden and make exhibiting more attractive, and to make judging more fair, consistent, and useful to exhibitors. These can be in the fields of judging methodology, education of exhibitors, expansion of exhibiting classes, training of judges, improving and clarification of rules and guidelines, and/or recruitment and training of apprentice judges.